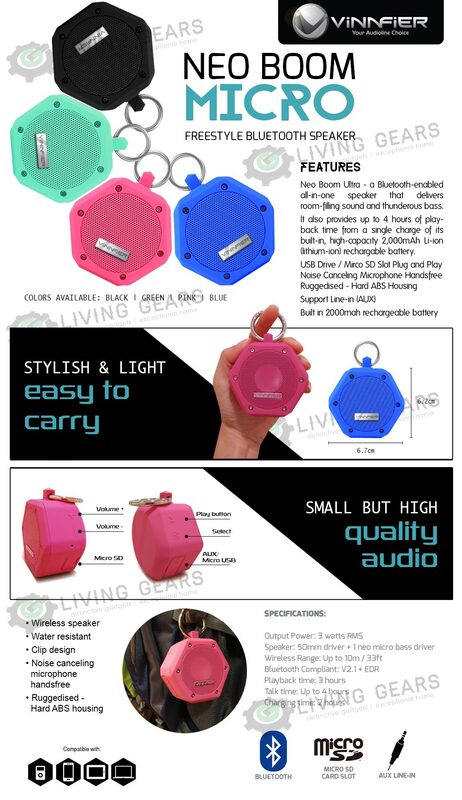 The mini yet ultra powerful, the lightweight Neo Boom Micro Bluetooth Speaker from Vinnfier proves the ultimate on-the-go solution for keeping the music alive wherever you go. With this Neo Boom Micro Bluetooth speaker, you can now experience loud and exceptionally clear sound from a compact size of speaker. With high performance compact driver, the Neo Boom Micro can deliver your music as loud and clear as you needed, wherever you take it. It is also feature with the water resistant function by allowing you to play your audio even though in the rain with its premium materials. It also provides up to 4 hours of playback time from a single charge of its built-in, high-capacity 2,000mAh Li-ion (lithium-ion) rechargable battery.